AgroAtlas - Crops - Hordeum vulgare L. - Barley (six-rowed). Hordeum vulgare L. - Barley (six-rowed). Varieties: biennis - winter barley, annua - spring barley. Hordeum hexastichon L., Hordeum sativum Pers., Hordeum polystichum Doell., Hordeum polystichum D.Asch. et Graebn., Hordeum vulgare ssp. polistichum Schinz et Keller, Hordeum sativum ssp. vulgare (L.) Orl. 2n=14. Barley is an annual herbaceous plant. Its rootage is fibrous. Barley primary (embryonic) roots are to be distinguished from its secondary (nodose) roots. Embryonic roots issue from the embryo's rootlet and continue their development preserving their functions till the vegetation of the plant is over. Secondary roots develop underground. They issue from the lower stalk nodes nearer to the surface of the ground. Barley stalk length varies greatly from 45 to 160 cm. It depends on growth conditions. The internodes located in the lower part of the stalk are shorter than those in the higher part. Barley stalk is 1.7 to 6.5 mm thick. The stalk becomes much thinner at its uppermost internode. There the spike becomes fragile which causes much waste while harvesting. Barley leaves are alternate. Each leaf consists of a sheath and a lamella. Leaf lamellae form a sharp angle with the stalk with corniculate auriculae at the both sides of the base. The tips of the auriculae overlap. The auriculae are whitish. Sometimes they are tinged with anthocyanin and are violet in color. The shape and color of barley auriculae permit to distinguish between different cultivars. Barley stalk, its leaf sheath, the leaf and the spike are often covered to a different degree in a waxy film. This is especially well-pronounced in arid zones. The upper leaf is smaller in its size but is similar in shape to lower ones. The second tier downwards is considered to have the most typical leaves. A barley leaf is 8 to 25 cm long and 0.4 to 3.2 cm wide. Leaf lamellae may be tinged with different shades of green. Barley inflorescence is a spike without a terminal fruit-bearing spikelet. A barley spike consists of a flat geniculate rhachilla and some alternate sessile spikelets, located in its notches. Each genicula of the barley rhachilla is from 2 mm (with solid-eared varieties) to 4 to 5 mm long (with loose-eared varieties). Each barley spikelet has one floret and forms one caryopsis. Six-rowed barley varieties usually have 3 fertile spikelets at each rhachilla notch. With two-rowed barley varieties only the middle spikelet is fertile. The two lateral ones remain barren. Each barley spike has 2 spike glumes and 2 floral glumes (outer and inner), 1 gynaecium, 3 stamens and 2 lodicules. Spike glumes may be narrow, linear-lanceolate (up to 1 mm wide) or wide (up to 2 mm wide). They may have hairs or be smooth, often with a very thin awn. The form and other features of hairs on barley spike glumes are constant and are taken into consideration at cultivars' approval. Inner floral glume adheres to the rhachilla. Is has a two-keeled shape and is always awnless. Outer floral glume in its uppermost part transforms into awn which may be scabrose or smooth, long or short. Some barley varieties instead of awn have lobate trifurcate appendages - the furcae. Very seldom the floral glume has neither awn, nor furcae. Barley flowers are bisexual. Its androecium consists of 3 anther filaments with anthers on their ends. The ovary is unilocular with one egg-shaped ovule. A barley flower is usually fertilized with its own pollen. Thus barley is cleistogamic. Cross-fertilization occurs with cultivated barley in exceptional cases while self-fertilization is typical for most modern cultivars. Barley fruit is a caryopsis 7 to 10 mm long and 2 to 3 mm in diameter. The caryopsis is diamond-shaped, oblong or elliptical, its color ranges from yellow and green to brown and violet. 1000 barley kernels weigh 37 to 48 g.
Barley seeds begin to germinate at a comparatively low temperature (1 to 3° C). However, optimal temperatures for barley germination are 18 to 25° C. Barley seeds which did not terminate their afterripening germinate faster at lower temperatures (6 to 8° C). Germinating plants are sensitive to unfavorable environmental conditions (lack of moisture, low temperatures, soil crust formation, redundant moistening, and excessive seed planting depth). The period from the first sprouting to the first bushing out lasts on the average 10 to 15 days. Sometimes it drags on for 20 to 25 days. The number of shoots on a plant is called "bushing energy". Barley bushing out may have different duration and intensity. Retarded development entails growth intensification including bushing out. Bushing intensity is related to genetic features of different cultivars. In the temperate latitudes leaf tube formation with spring barley begins 3 to 4 weeks after sprouting, in the South - after 4 to 6 weeks. In the South this process is delayed due to barley reaction to shorter daylight. Barley plants begin to blossom upon maturation of and ejection of anthers. With barley this often coincides with the beginning of spike formation. In the temperate latitudes and on wet soils barley plants sometimes start blossoming a few weeks after spike formation. Kernel ripening may be disturbed by such unfavorable environmental conditions as drought, excessively high temperatures, morning and night frosts, etc. At their milk-ripe stage barley kernels are still green like the rest of the spike. Their water content may reach 50 to 65 %. These kernels are soft. Regular, optimal process of barley kernel formation is critical for rich harvest and kernel quality. Forced fast ripening and kernel shrinkage entail poor starch accumulation, deterioration of valuable starch fractions and undesirable grouping of nitrogen compounds. Long rains during kernel ripening prolong kernel maturing period and degrade kernel quality. Kernel germination on standing plants is especially dangerous as it completely degrades nutritive and fodder value of barley kernels and renders them useless for brewing trade. Such kernels lose germinating capacity. Vegetation period length with spring barley varies greatly (55 to 110 days) depending on particular cultivars' features and cultivation conditions. Winter barley germination period lasts for 280 to 300 days. Despite acceleration of spike formation by higher temperatures, their influence thereon is lower that that of daylight length. With higher temperatures in the South and its shorter daylight, the interphase period (between sprouting and spike formation) in those zones is usually twice as long as in trans-polar areas. The second interphase period between spike formation and maturity depends mainly on the temperatures. Thus in the South barley kernels ripen and mature almost twice as fast as in the North. Winter barley cultivars with lower hardiness grow faster in the fall and have a faster growing-point differentiation. Therefore they become less hardy and perish at low temperatures. Sucrose content in the green material of relatively hardy barley varieties is 3 %, that of less hardy barley varieties is 1.2 to 1.6 %, that of spring ones is less than 1%. Barley is highly adaptable to different soils including podzols of the non-chernozem belt, southeastern solonetzic soils and those in Transcaucasia, deep and common chernozems, sierozems of Central Asia, etc. The best barley yields and kernel quality are observed on fertile loamy soils with neuter pH and a deep plough-layer. Barley precursors are tilled and leguminous crops. Barley is responsive to organic fertilizers (20,000 to 40,000 kg per hectare) and mineral fertilizers (30 to 45 kg of N per hectare, 45 to 60 kg of P2O5 per hectare, and 60 kg of K2O per hectare). Irrigation increases greatly the height and bushing of barley plants. The number of kernels per spike and the weight of each 1,000 kernels increase on irrigated soils as well, increasing the load on the stalk. Therefore barley varieties cultivated on irrigated soils must be able to resist lodging. Barley is one of the oldest cultivated plants in the world. Kernels of two-rowed barley discovered on the sites of ancient settlements in Iran, Iraq and Turkey date back to the 8th and 7th millennia B.C. 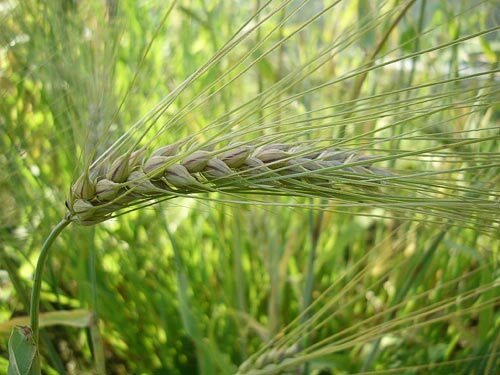 Only six-rowed - mainly chaffy - barley varieties were cultivated in Egypt in the 6th and 5th millennia B.C. Both two-rowed and six-rowed barley kernels were found only later at archaeological digs in Fayum while investigating later predynastic strata. Barley entered Europe from Mesopotamia via Asia Minor to Geece and from there - via the Balkan Mountains - to the Danube valley and South Russia. In modern Britain barley first appeared in the mid 4th millennium B.C. The oldest cultivated crops in China are millet, rice and sorghum. Wheat and barley cultivation in China was first reported in the late 2nd millennium B.C. Barley was introduced to America by European settlers in the 16-18th centuries. To Australia it was introduced by the English in the late 18th century. In the year 3000 B.C. on the territory of the present day Ukraine and Moldova existed the so-called Tripolye culture with well developed agriculture. Barley, wheat and millet were cultivated in that area even before the period of Tripolye culture in the 4th and 3rd centuries B.C. B.B. Piotrovsky considers Transcaucasia to be one of the oldest barley cultivation centers of the world. At present barley cultivation is widespread in many areas with contrasting environmental conditions. The vast natural habitat of barley can be explained by a great number of its ecotypes and their adaptability to their environment. In the North of Europe barley grows beyond the Polar Circle: 70° N - in Norway, 68° N - in Finland. In Western Siberia and Yakutiya barley is cultivated as far up North as 67° N. In Asia and Africa barley grows even in the tropics. It is found quite near the equator in southern India and China, in Sahara oases, and in the lower Nile area. In the mountains barley grows as high up as any other cultivated plant can and higher as any other cereal crop. In Tibet barley is cultivated at the altitude of over 4,500 m above sea-level, in Peru - of over 4,000 m, in Tadzhikistan - at 3,000 to 3,200 m. The areas sown with barley on all categories of farms in 2001 in the Russian Federation totaled 10,121,000 hectares (21,4 % of the whole area sown with cereal crops). Only wheat is cultivated more frequently than barley. 16 cultivars of winter barley bred for southern zones of Russia (Bastion, Victoria, Rosava, etc.) and 123 cultivars of spring barley were approved in the Russian Federation in 2004. Main spring brewer's barley varieties are: Acha, BIOS 1, Vizit, Gonar, Zazersky 85, Mikhaylovsky, Moskovsky 3, Nur, Nutans 553, Odessky 100, Raushan, Signal, Suzdalets, Kharkovsky 99, Elf. Barley breeding agencies are: Krasnodar P.P. Lukyanenko Research Institute for Agriculture, Stavropol Research Institute for Agriculture, Krasnoyarsk Research Institute for Agriculture, Daghestan Research Institute for Agriculture, All-Union Research Institute for Sorghum and Other Cereal Crops, Northeastern N.V. Rudnitsky Research Institute for Agriculture, Siberian Research Institute for Livestock Fodder, Siberian Research Institute for Agriculture, Central Non-Chernozem Belt Research Institute for Agriculture, Ural Research Institute for Agriculture. Barley is a basic cereal and fodder crop. Barley kernels are a concentrated livestock fodder. Barley straw and chaff are also used as fodder. Barley kernels are used to produce flour, pearl barley, peeled barley, and coffee substitutes. Barley malt is an essential raw material in brewing trade. Only low quality bread can be baked from barley: it is coarse and crumbles easily due to its low quality and high gluten content. Mature barley kernels usually contain 80 to 90 % dry matter and 10 to 20 % water. Their maximum overall carbohydrate content is 82 % of each kernel's dry matter. Barley carbohydrates are: 45 to 66 % starch, 13 to 15 % hemicellulose, 3 to 5 % cellulose, 6 to 8 % gums and mucus, 2.7 to 4.2 % dextrines, 1.2 to 2.8 % soluble sugars. Barley starch consists of 15 to 20 % amylose and 80 to 85 % amylopectin. Amylose is the most valuable component for brewing trade. Its quantity determines the value of barley as a source of malt. Barley proteins include over 20 amino acids; 8 of them are essential. Barley gluten is dark in color, snappy, stiff and non-porous (2-5 %). Barley kernels contain vitamins B (aneurine and riboflavin), ascorbic acid, tocopherol and fatty oil. Protein content of a barley kernel varies from 9.5 % to 20 %. High protein content determines the fodder value of each barley variety. Barley varieties used in brewing trade have kernels with a low protein content (9.5 to 11 %) and a high starch content (60 to 65 %). Quality of barley as a source of malt is mostly determined by the extract content of finely ground malt ant its activity. If the extract contents is high (over 78 %), this barley variety is a valuable source of malt. Barley is usually sown in drills or in closed drills. 180 to 250 kg of barley seeds are usually sown per hectare at the depth of 3 to 4 cm. Barley is gathered in by direct combine harvesting and by two-stage harvesting (brewer's barley is harvested when its seeds are fully mature, fodder barley is harvested at the wax ripeness stage). The average yield is 1,600 to 2,000 kg per hectare.